I used sqoop import many times and have never run into this issue. This made me wondering what’s going. I checked out the CDH version. The version is 5.8.0 and I used to use CDH 5.7 a lot. The Cloudera Quickstart VM is using CDH 5.8.0 and this is the first time I am touching CDH 5.8. It might relate to CDH 5.8. Did some research and found someone had the exact issue as I did. It is a sqoop bug: SQOOP-2999Sqoop ClassNotFoundException (org.apache.commons.lang3.StringUtils) is thrown when executing Oracle direct import map task. It looks like the new version of Sqoop in the CDH 5.8.0 used a new class OracleUtils that has a dependency on org.apache.commons.lang3.StringUtils. The jar that contains the class is not on the classpath that Sqoop passes to the mappers. Therefore the exception thrown at runtime. Unfortunately the fixed is in CDH 5.8.2 as indicated in the Cloudera’s release note and the first sqoop bug in the note is this one: SQOOP-2999. At this moment, I don’t want to go through the upgrade or patching of CDH. Tried to see whether there is any workaround on the internet. Could not find anything related to this one. So I will use my way to fix this issue. First I need to find out which jar file containing this class. There is one post discussing about this class and the related jar file: commons-lang3-3.1.jar. Luckily I do have a commons-lang3-3.1.jar file in the system. Next I need to figure out how to add this jar to the class path for Sqoop. Majority of Hadoop environment variables setting can be found at /etc/default directory and I did found a file called sqoop2-server. After restarted Sqoop service, no luck. Still not working. I could change /etc/sqoop2/conf/setenv.sh file and add this jar file to CLASSPATH. But there is no CLASSPATH used in this script. I also don’t want to change something and completely forgot later on. So I tried the option to add CLASSPATH on Cloudera Manager. But the tricky question is to which parameter I can add. As Sqoop is managed by YARN, I tried to the add the class in the YARN Application Classpath or yarn.application.classpath. 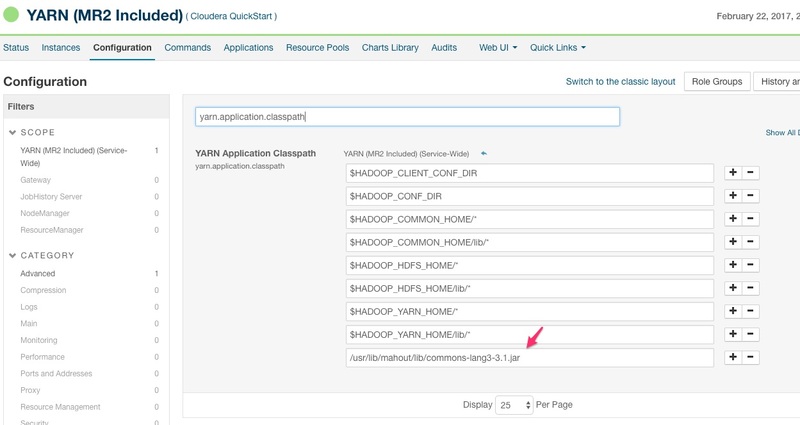 After the change, redeploy the client configuration and bounce the CDH cluster. Rerun the Sqoop job and it completed without error. Please note: this is just temporary workaround solution. The right approach should still be upgrade to the new version of CDH.